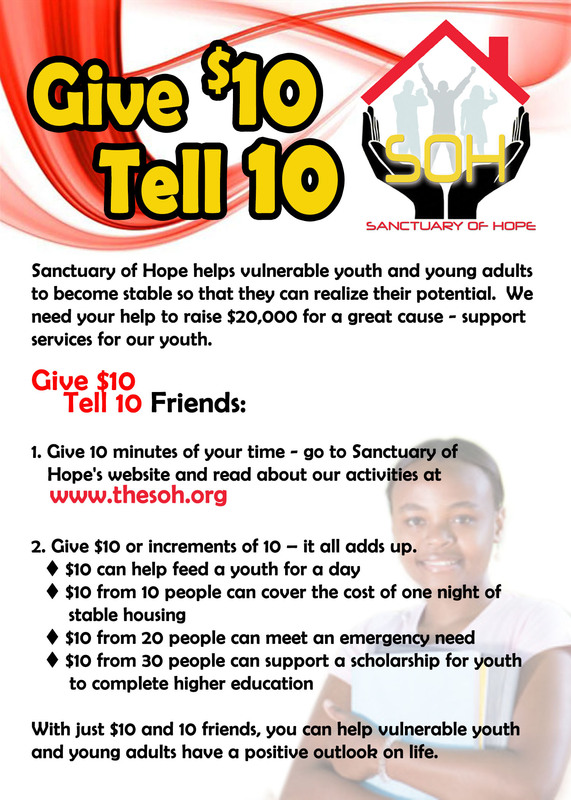 Sanctuary of Hope (SOH) needs your help to impact of vulnerable youth and young adults and to fill a critical need. SOH has more than doubled the number of vulnerable and homeless youth served than previous years. This 2017 fiscal year, SOH saw 432 youth and young adults of which, 311 were new. SOH moved 40 housing insecure and homeless youth into homes of their own, provided an address for over 30 homeless youth to receive their mail, created permanent connections for 200, and gave out 3,000 bus token for transportation. Getting youth to accomplish their housing and education goals is not easy. However, it’s rewarding to have a young person bring back a diploma or degree as a recognition of achievement or to see keys dangling in excitement of having a place to live. We ask for you to support our Give 10 Campaign. Give $10 and tell 10 people about SOH and inspire a movement of giving for SOH to help youth realize their potential.